Located midway between Yakima to the northwest and the Tri-Cities of Pasco, Kennewick, and Richland to the east, Grandview is central to the Northwest's large urban centers of Seattle, Portland, and Spokane. The townsite was chosen in 1905 as the final stop on the Sunnyside branch of the local rail line. Early farmers were met with blowing sand and jackrabbits, but with the addition of irrigation, lush fruit orchards and champion corn soon replaced native sagebrush. 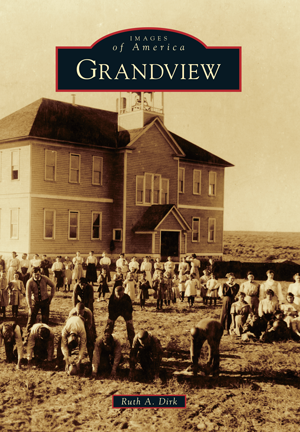 In 1910, one year after incorporation, 320 people called Grandview home. In the 1920s, dairies, poultry farms, and a winery marked a further transformation to the landscape. By 1940, the acreage given over to grape vineyards had greatly increased, asparagus was becoming a major crop, and more than 400 acres of hops were harvested. To this day, Grandview remains a small town where farming and related industries are major employers. Ruth A. Dirk, a Grandview resident of more than 35 years, has been employed by the City of Grandview as assistant librarian since 1987. In 2009, just in time for Grandview's centennial celebration, she was invited to contribute to the Washington Rural Heritage online collection.